Environmental health encompasses the assessment and control of those environmental factors that can potentially affect human health, such as radiation, toxic chemicals and other hazardous agents. It is often assumed that the assessment part is just a matter of scientific research, and the control part a matter of implementing standards which unambiguously follow from that research. But it is less commonly understood that environmental health also requires addressing questions of an ethical nature. How can we determine the "acceptable" risk level for the general population or for certain groups? How should we deal with uneven distributions of risks and benefits? How do we communicate about risks with the stakeholders? This multidisciplinary collection brings together a number of leading researchers and scholars in order to generate discussion surrounding these key questions, and to bring the ethical implications of science and technology to the forefront of critical thought. 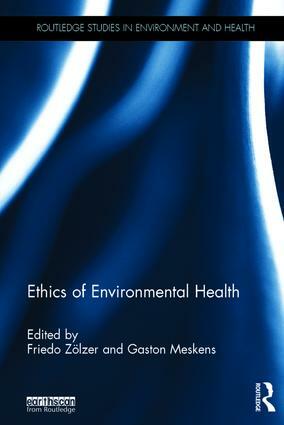 Providing a broad overview of the Ethics of Environmental Health, its philosophical foundations and practical applications, this book offers a significant contribution to ongoing discussions in sustainable development and will be of interest to scholars and practitioners of Environmental Health, urban studies and healthcare. Ethics of Environmental Health makes a valuable and unique contribution to the emerging field of environmental health ethics. The book includes papers discussing important aspects of environmental health ethics, including risk assessment, precaution, distribution of health risks, ethical decision-making, and global and local issues. I recommend it highly. The International Commission on Radiological Protection has long recognised the importance of ethics for the system of radiological protection. We are delighted to have played an active role in the completion of this book project and to give it our full endorsement. Important environmental health determinants go unacknowledged in policy and law. This volume discusses a number of these, intending to inspire a return to the awareness of the harms we condone, neglect, or allow others to perpetrate with impunity when we ignore the ethical dimensions of health research, policy and law. Friedo Zölzer is Head of the Department of Radiology, Toxicology and Civil Protection at the University of South Bohemia, Czech Republic. Gaston Meskens works part-time with the Centre for Ethics and Value Inquiry of the Faculty of Arts and Philosophy at the University of Ghent, Belgium and with the Science and Technology Studies group of the Belgian Nuclear Research Centre SCK-CEN, Belgium.